“Beach House One” is an architect designed multi level free-standing Beach House located at the fringes of the sand dunes on Tura Beach, Merimbula. 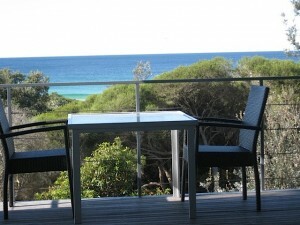 The property has direct beach access with no roads to cross and within 50 metres you will be at waters edge. 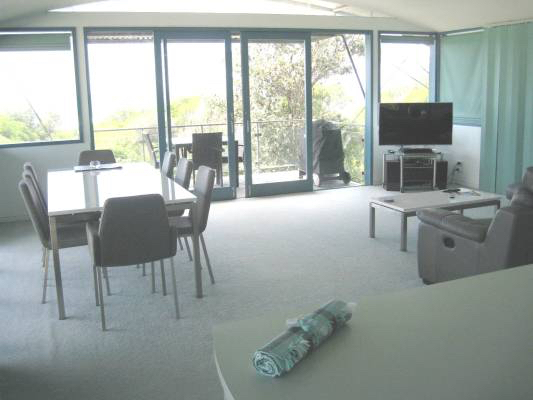 Spectacular ocean and headland views can be seen from the entire upper living area which has walls of floor to ceiling louvered windows and 2 large glass sliding doors which all capture the sea breezes. The balcony overlooks the ocean and provides a wonderful opportunity to view spectacular sunrises, migrating whales, dolphins and sea eagles. The lower bedroom level provides a more intimate atmosphere surrounded by trees and vegetation, with the master bedroom and en-suite overlooking the native garden. open plan living area including kitchen, dining, lounge and balcony with BBQ and table setting. Master bedroom with King Size bed, en-suite with spa bath, walk in robe. A second bedroom with 2 Single Beds is adjacent to the main bathroom. Double under cover parking, laundry (washer & dryer), native garden and lawn area with outdoor shower and clothesline.